FINAL SPACING: Use individually or in clusters. BLOOM/FRUIT: Golden-orange tubular flowers on spikes that usually bloom in the fall. 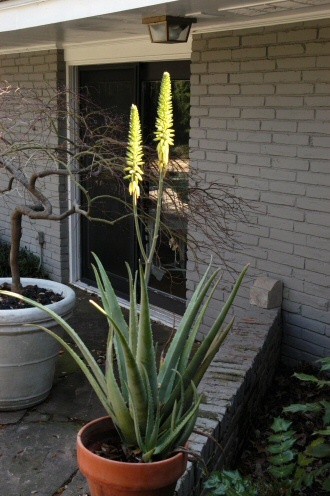 GROWTH HABITS/CULTURE: Aloe vera grows upright with thick, succulent leaves in a rosette. It ranges in size from very short flower stems to some with stems over 20 feet tall. Aloe vera is easy to grow in containers or in beds. Aloe won’t usually survive freezing winter temperatures anywhere but the southern Rio Grande Valley. It likes healthy soil but must have excellent drainage. PROBLEMS: Can sunburn in full sun if quickly moved from indoors or a shady place. Rotted roots if over-watered. Bacterial diseases are a threat in wet soil. HARVEST/STORAGE: Cut lower leaves off and use the gel and juice directly. Cut leaves will last for several days in cool temperatures, however the fresh gel loses its power or “goodness” quickly when exposed to air. CULINARY USES: The flowers are edible. Pick and eat before they fully open. MEDICINAL USES: Aloe has been used as a healing herb since the dawn of time. The sticky gel used to treat skin abrasions, sunburn, insect bites and burns. It is taken internally for stomach problems, mouth ulcers, and to improve the immune system. It is used topically to treat or help prevent sunburn, and to treat poison ivy rash. Experiments show that aloe protects from ultra-violet rays and may help in the treatment of cataracts and skin cancer. It is included in many beauty creams, lotions and in health drinks. Some African tribes rub aloe on their skin to remove the human scent before they stalk their prey. LANDSCAPE USES: Good ornamental container plant. OTHER USES: Body-care products. Check out the range of products at aloevera.com. 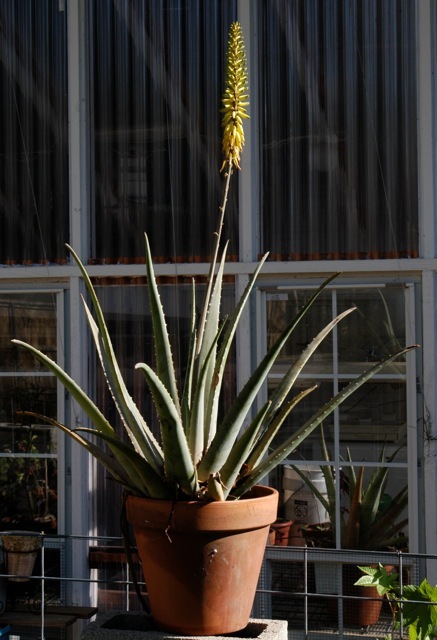 INSIGHT: Aloe vera speeds the regeneration of cells in plants and animals. Even if you do not garden, keep an aloe plant in your kitchen to use on burns and cuts. To apply, simply cut a leaf off of the plant, and squeeze the gel onto the burn or cut. For more serious burns or cuts you can open the leaf long ways and apply it to the burn as a poultice. Answer: I've never seen that before. Try repotting, watering less and giving the plant more sun. Did you Know? The sap from some aloe plants is edible. It is used in teas and beverages. 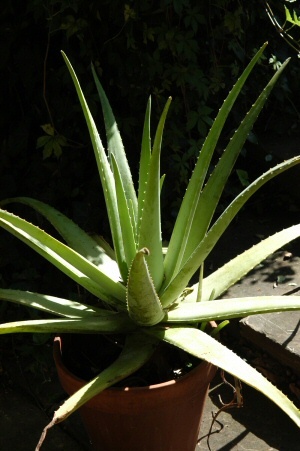 However, some aloe varieties should be considered poisonous. Do not use the sap for internal consumption, if you do not know which ones can be consumed internally. Aloe is propagated by offshoots from the mother plant. Simply remove baby plants, and repot. This is by far, the most common way to propagate aloe. The seeds from flowers can also be harvested for propagation. As an indoor houseplant, Aloe plant care is a cinch. Select a pot or container that fits your room decor. It should have holes in the bottom for good drainage. Aloe prefers full sun, but will tolerate a light shade. Plant roots spread wide, but are shallow in the soil. Water thoroughly. Then, allow the soil to dry between waterings. Our only complaint about this great plant, is it can become top heavy and fall over, uprooting itself from the soil. Fertilize once a month for best growth. Or, use fertilizer spikes. If you are going to grow Aloe outdoors, treat it as an annual. It will succumb to frost and freeze. Protect it, or bring it indoors in cold weather. Harvest aloe for use, by removing a large stem or stalk with a sharp knife. Then, squeeze out the sap.